Saunders in his History of Watford describes the area around Oxhey chapel as “quiet pastoral scenery”. How different it is today, some 40 years later. It was probably a good description of the country around Little Oxhey chapel in the eighth century. Oxhey, once called Oxangeheage, was a small clearing of scrub and heath in the forests around the north of London when King Offa gave it to the St. Albans monastery. When the monks settled in Oxhey in AD 793, they farmed the land and probably helped supply the needs of the mother house and St. Albans. But one of their first tasks was to build a chapel. The Oxhey Charter, a copy of which is in the chapel today, was signed in 1007 because of a dispute concerning Little Oxhey Chapel and the surrounding lands. However, the abbots of St. Albans won their appeal to King Ethelred and consequently kept Oxhey. The monks remained until the dissolution of the monasteries in 1536-9, when Little Oxhey Chapel became unused and fell into disrepair. At the end of the sixteenth century, Queen Elizabeth gave Oxhey to a Baron of the Exchequer, Sir James Altham. 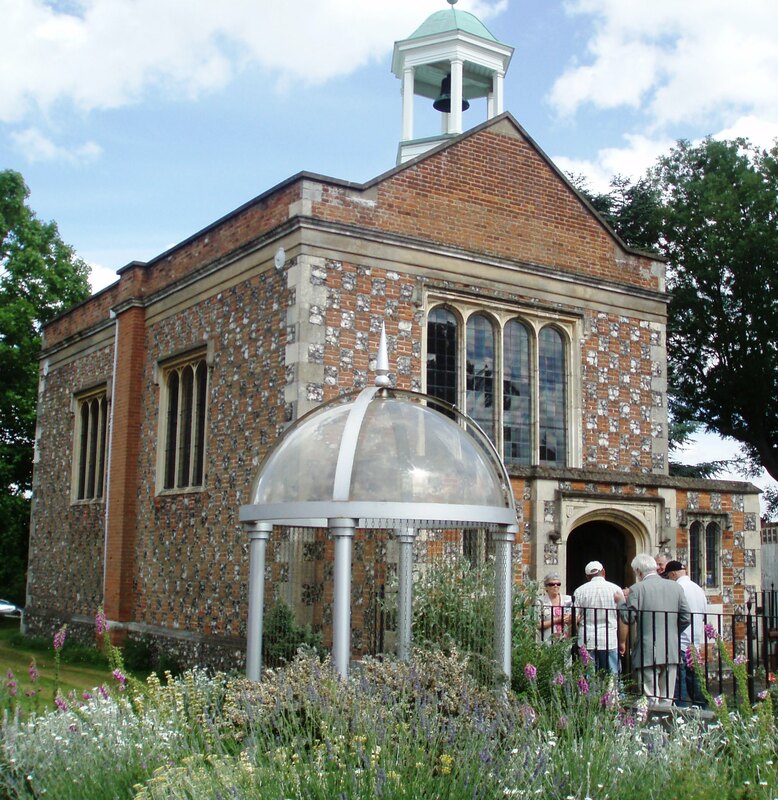 He set up home in the ruins of the monastery and in 1604 started to build the present Oxhey Chapel, completing it in 1612. The chapel is plain and rectangular with a porch and vestry at the western end. It is made of red brick and flint, and some of the foundation material probably came from an earlier chapel on the same site. Inside are a number of interesting features, but only the door, Altham effigies, woodwork at the west end, reredos, and the sanctuary floor remain from the seventeenth century. The chapel has been altered and repaired several times inside and out since 1612. The Bucknall family, who owned the nearby Wiggenhall estate, took possession of St. Cleeves, Altham’s house, and the surrounding buildings including the chapel. St. Cleeves was demolished in 1688 and the late Rev. Newton Price believed the oak for the chapel reredos came from the house in 1690. The Bucknalls had another house, Oxhey Place, built slightly to the west of the St. Cleeves site. This first Oxhey Place was demolished in 1799. Besides Sir James Altham and his wife (whose effigies are beautifully displayed on the south wall), members of the Bucknall family are also buried at Oxhey. From 1799 to 1852, Oxhey chapel became the home of owls and bats, used as it was for storage of lumber. Probably for the first time since 1612, the chapel was not used for divine service, although it may also have been used as a barn during the Commonwealth period. Some time during the first half of the nineteenth century the second Oxhey Place was built – a neo-Jacobean building with tall chimneys. This big mansion was burnt down and eventually demolished in 1960. Thomas Sotheron Estcourt owned the second Oxhey Place and in 1852 had the chapel repaired. It would appear the repairs were not very judiciously executed, and much interesting Jacobean work was destroyed. After the 1852 repairs, services were held for local inhabitants, Oxhey Chapel was then in the parish of Watford, but was not normally served by Watford clergy. In 1872 the pioneering Newton Price was made chaplain and his salary came from subscriptions given by ‘such people as Carnegie of Eastbury, and W. H. Smith of bookshop fame. In 1877, Oxhey Estate was sold in building lots, the area around Oxhey Place and the chapel being bought by the Blackwell family (of Crosse and Blackwell fame). Thomas F. Blackwell had the chapel extensively repaired and refurnished in 1897. The east and north windows were unblocked, and the eighteenth-century south windows were altered to a four-light perpendicular style. The west window remained unchanged. New pews were made and put in choir-wise, and two vestries were added to the 1612 porch. The Blackwells kept the estate until 1946 when they sold it to London County Council. The chapel has been a source of controversy since the turn of the century, when a row erupted about the status of Oxhey chapel, which some claimed as a public parochial building. There was also so much difficulty in getting the chapel repaired, that it was eventually called All Saints’ because it was on an All Saints’ Day World War II that the problem were at last overcome. While the difficulties existed, Mrs Anthony Blackwell suggested demolishing the chapel and having her husband’s coffin removed. The idea was resisted tactfully by the Rev. Basil Whitworth, then priest of St. Alphage’s, Carpenders Park. After extensive repairs in 1963, the chapel became Church of England property, and it should now have a secure future.